Detecto stadiometers have long been the choice for accurate medical height measurement. Everything needed for operation is included with the height rod and installation takes seconds with the included hardware and built-in wall-mount bracket. Easy to install, easy to operate. Height range: 30 to 78 inch (76 to 200 cm), 1/4 inch (1/2 cm) graduations. 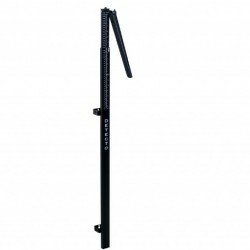 Detecto wall mount height rods have long been the choice for accurate medical height measurement. Everything needed for operation is included with the height rod and installation takes seconds with the included hardware and built-in wall-mount bracket. Merely lift the spoon and request for the patient to step up to be measured. Easy to install, easy to operate, and with American-made durable steel construction for longevity and reliability. Height range: 30 to 78 inch (76 to 200 cm), 1/4 inch (1/2 cm) graduations. Shipping weight: 8 lb / 3.6 kg.